This „HNC“ series type was developed for use on rotary pulse special machines or installation ones. There is enormous force ensuing from this small size of appliance. The piston travel limits are scanned via built-in electrical limit sensors and correspondingly linked up with two separate 5/2 directional magnetic control valves. 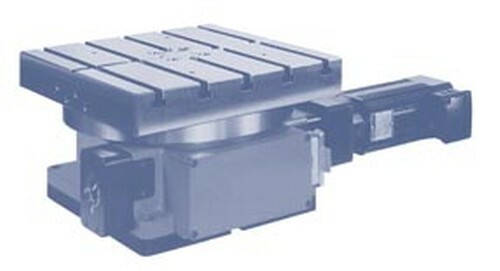 This external directional control offers manifold possibilities such as reciprocating action or differing fractional pitches. The switch cycle can also be interrupted for other functions. Since there are a greater amount of control possibilities on special machines, these valves can be integrated into the control box. 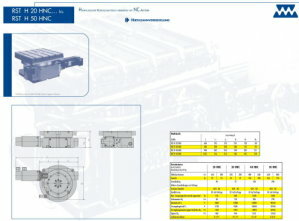 With these HNC designs the rotary movement is achieved with servodrive and gearing. Via separate one-way restrictors the elevation and interlocking movement can be set to suit the built-up load. These valves or valve combinations can be supplied as an extra on request. Whereupon even with large load gyrating momentum a flawless and consistent movement is guaranteed. The emergency stop function is ideal and can be applied not only for reasons of safety but also as a control function. It is indispensable when changing tools between the stations. The mechanical construction of these appliances is very resistant to machining power from any direction. Standard appliances are protected against splashed water. The appliances can be fitted with an additional sealing when being used under flood coolants. An abundant selection of accessories and special designs round of this programme that hardly leaves any wishes unfulfilled. T-slots in the table plate, pneumatic valves or stationary limit switches instead of the electrical limit switches, pneumatic weight compensation.